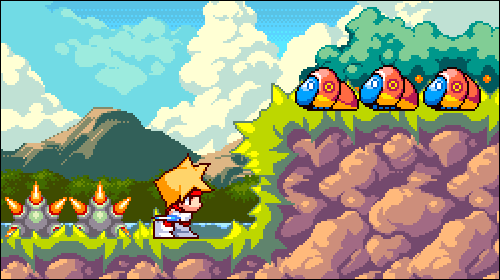 Buster is a new platformer by the creator of Akuji the Demon and Guardian of Paradise. Press the X key to slash, and tap the Z key to jump or double jump. Hold the C key to absorb collectibles. To dash, simply tap the left or right cursor key twice in rapid successions. It is possible to scale walls vertically by doing a running jump, then quickly tap the Z key when your character is against the wall. You can also grab hold of certain walls by pressing the X key after executing this move.